Our latest competition is a fundraising collaboration between Willow Burn Hospice and writer Rachel Cochrane, inspired by Rachel’s latest drama, Benchmark. Available for everyone to listen as an online radio play, Benchmark takes its inspiration from the ‘In Loving Memory…’ plaques found on benches which are usually situated in a place of beauty or of special significance to those commemorated. This competition, however, is to celebrate the living and reflect the ethos of Willow Burn Hospice – treasuring life. Through Benchmark radio play and associated writing competition, we want to encourage people to think positively about their lives, help break the taboo around death and raise vital funds for Willow Burn Hospice. What would it say on the plaque? Why have you chosen that particular place? In our writing competition we’re asking you to celebrate the good things about your life as you are now, with a great first prize of a bench with your own personalised plaque. First Prize is a solid Iroko Dalton 3 seater (1500cm) hardwood bench with personalised plaque. To include an engraved plaque (attached) and delivery within the UK. Kindly donated by Faithful & Gould, Victory Signs and Solid Oak Hardwood Furniture. This national competition is open to all adults (18+) in the UK, so if you’ve never written creatively before – why not give it a try? There will be an entry fee of £5 with 40% of that donated to Willow Burn Hospice. Click here to read terms and conditions of entry. After relishing and surviving academic life, Bishop Auckland writer Wendy Robertson has published more than twenty novels and two short story collections and ran Bishop FM’s Writing Game for two years. 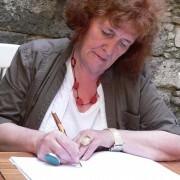 More recently, as part of Room To Write, she has run workshops on the Short Story, the Novel and The Novella. She writes about her writing in posts in her blog Writing Life Twice Tasted. Dr Philip le Dune is a GP principal at Annfield Plain Surgery where he has worked since 2004. He graduated from Newcastle Medical School in 1986 and became a Member of the Royal College of General Practitioners in 1990. During his training he worked at St Benedict’s Hospice in Sunderland where he developed an interest in Palliative Care & continues to work in this field at St Cuthbert’s Hospice in Durham where he works one morning each week. His practice is involved in Clinical Research and also in the ongoing support of primary care clinicians who are experiencing difficulties in their work and domestic lives. He is actively involved in charity work through Aid to Burkina, a charity set up to help provide medical, educational and social benefits in Burkina Faso, West Africa which he visits regularly in a supervisory capacity. Sue Spencer first attended a creative writing workshop with Julia Darling in 2004 and her life has never been the same since. Finding magic in words Sue has studied the MA in Poetry at Newcastle University and has led a number of writing workshops in the North east. Originally the poet in residence at Willow Burn Sue moved from her post as Senior Lecturer in Adult and Community Nursing at a local University to be Head of Clinical Services at Willow Burn. One of her visions (she has quite a few!) is to ensure that the creative arts and health care practice are linked together for the benefit of all patients, carers, families and staff who have contact and connections with Willow Burn.